Loughborough Lightning is all set to take on Lancashire Thunder in 22nd Match on Saturday, August 11, 2018. In Today’s Dream11 Fantasy Cricket Match of LL vs LT 22nd T20, Kia Super League, 2018, we will cover Fantasy Cricket News and Tips, Toss Prediction, Pitch Report of Haslegrave Ground, Loughborough, Probable Playing 11 and Who Will Win the Match? You May Like to Read Today Match Prediction. Who Will Win the 22nd T20 Match, Between LL vs LT and Toss Prediction? Where Can You Watch the Live Streaming of LT vs LL, 22nd T20 or Channels to Watch? The fight will be between the second position holder and the fourth position holder. Loughborough Lightning has won five matches out of 7 matches and Lancashire Thunder has won three matches of 7 games. LL has played a good cricket in this season of Women’s Super League and has an upper hand. According to our astrology prediction, LL will win the match today. The team winning the toss should opt to bat first and this has been seen in the last three matches played on this ground. According to our astrology prediction, LT will win the toss and ask LL to bowl first. Date: The match will be played on the 11th of August 2018 (Saturday). Match: Women’s Cricket Super League, 2018, LBL vs LT, 22nd Match. Time: 01:30 PM GMT, 07:00 PM IST, 02:30 PM Local. So far three matches have been played on this ground in this season of Kia Super League. A couple of matches have witnessed a batting wicket and one game witnessed a bowler favoured wicket. Today the pitch will play same as it played in last matches. It will be a batting wicket which will also assist the bowlers if they bowl in the right area. Overall it will be a neutral pitch. Note: If you know how the pitch will play, then you can select your team according to the pitch. Make use of the pitch while selecting your team for fantasy leagues. From the above pitch report, you would have understood that making a team which is a combination of batsmen and good bowlers would be a wise choice. It is expected to be sunny in the morning and afternoon. The clouds can be seen in the latter half of the day. The cricket fans and fantasy users can see the complete game as no rain is predicted. The temperature is expected to be 21-Degree Celsius and the humidity to be 40%, which may go up to 80%. Note: The weather condition may assist the spinners and the batswomen. 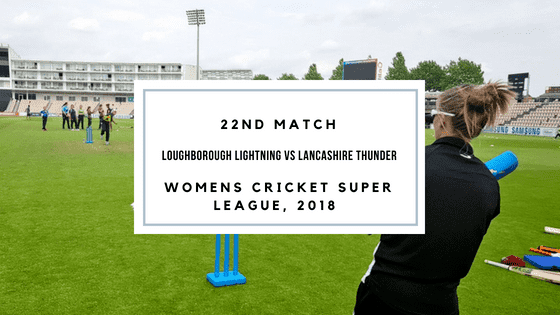 Loughborough Lightning and Lancashire Thunder have played three games against each other and LL have won a couple of times and LT has won a single game out of three. In the last encounter, LL defeated LT by 6 wickets with 29 balls remaining. JL Gunn and SFM Devine were the star performers on that match. Note: If you have the statistics of the head to head matches then you can get a fair idea about the team performance against each other. You can also get the idea of the winning team. You can see the live score and live ball by ball score here. You can also watch the complete live details of the match here. Rachael Haynes, Sophie Devine, Elyse Villani and Jenny Gunn are the key performers of the Loughborough Lightning Team. Although LL lost their last match, they will not think of making many changes in the team. They are most likely to play with the same playing 11 until and unless there is any fitness issue. Georgia Elwiss (c), Rachael Haynes, Linsey Smith, Elyse Villani, Kirstie Gordon, Jenny Gunn, Sarah Glenn, Georgia Adams, Amy Ellen Jones (wk), Lucy Higham, Sophie Devine. Sarah Glenn, Rachael Haynes, Georgia Adams, Tara Norris, Elyse Villani, Abigail Freeborn, Georgia Elwiss (c), Kirstie Gordon, Jenny Gunn, Sonia Odedra, Linsey Smith, Joanne Gardner, Sophie Devine, Amy Ellen Jones, Lucy Higham. Nicole Bolton, Amy Satterthwaite, E Lamb and Sophie Ecclestone are the key performers of Lancashire Thunder Team. Natalie Brown or Georgie Boyce either of the two will play today. A couple of changes are expected in LT team as they have lost three games back to back. Danielle Hazell (c), Eleanor Threlkeld (wk), Harmanpreet Kaur, Evelyn Jones, Amy Satterthwaite, Sophie Ecclestone, Nicole Bolton, Natalie Brown/Georgie Boyce, Kate Cross, Emma Lamb, Alex Hartley. Amy Satterthwaite, Harmanpreet Kaur, Georgie Boyce, Rachel Dickinson, Danielle Hazell (c), Sophie Ecclestone, Nicole Bolton, Eleanor Threlkeld, Kate Cross, Alice Dyson, Alex Hartley, Natalie Brown, Emma Lamb (wk), Evelyn Jones, Natasha Miles. Fantasy Cricket Expert Tips: Both the players are good. Amy Ellen Jones is our choice for the wicketkeeper as she is a top order batsman. 34.41% of the users have selected Amy Ellen Jones in their Dream11 Teams and 64.91% of the users have selected Eleanor Threlkeld in their Dream Teams. Make a combination of the above players for multiple teams. Fantasy Cricket Expert Tips: The above batswomen are most likely to score runs today. Make a combination of the above players for multiple teams. Fantasy Cricket Expert Tips: The above all-rounders are most likely to contribute the most. Make a combination of the above players for multiple teams. Fantasy Cricket Expert Tips: The above bowlers are most likely to take wickets. Make a combination of the above players for multiple teams. This is for head to head matches and small leagues. The leagues in which the maximum members are 20. Conclusion: This is it for Today’s Dream11 Fantasy Cricket Match Prediction of LL vs LT, 22nd T20 Match, which will be played on Saturday 11th August. We have covered all the details required to win any fantasy leagues. We have covered players recent and past performance, dream11 guru and crictom prediction, all the latest news and updates of Lancashire Thunder Team and Loughborough Lightning Team, weather report of Manchester, dream 11 best teams, keys players, the best choice for captain and vice-captain, where to watch the live match of LL vs LT, 22nd T20 Match and the details of live streaming of Kia Super League, 2018.